In the last blog post from our residential drug and alcohol rehab program in Texas, we looked at three of the reasons why drug abuse treatment doesn’t always work. If you’re like most people, you want to attend a program that actually does work, and you want to be rewarded for your efforts to stay clean and sober by tasting that success. Here are some more reasons why treatment sometimes doesn’t work, with some pointers for how you can use that knowledge to protect yourself from falling into the same trap that others have fallen into. However, if you stop there, you’re not setting yourself up for the best success. The harder work is re-training your brain, and the recovery from the mental and psychological addiction takes longer. Every time you hit a crisis, a trigger point, or a situation where you would have used, you now have to make a different choice. Ending rehab treatment too early can leave you without the resources, training, and practice that you will need to be successful. Choose a program that doesn’t end after just three to four weeks, but that gives you the time that you will need to renew your thinking patterns. Our Christian-based program has seen great success in the way that we teach you how to resist the cravings of addiction, break the old patterns that used to keep you trapped, and set you free to live a healthy, sober life. Have you noticed that some rehab programs are only successful for as long as the people are onsite, and then as soon as they leave, they fall back into their old ways? The point of rehab is supposed to be to get you to the point where you are staying sober on your own and making independent, self-guided choices. At rehab, you should get the tools you need to continue to live a sober life once the program is behind you, but this isn’t always the case. 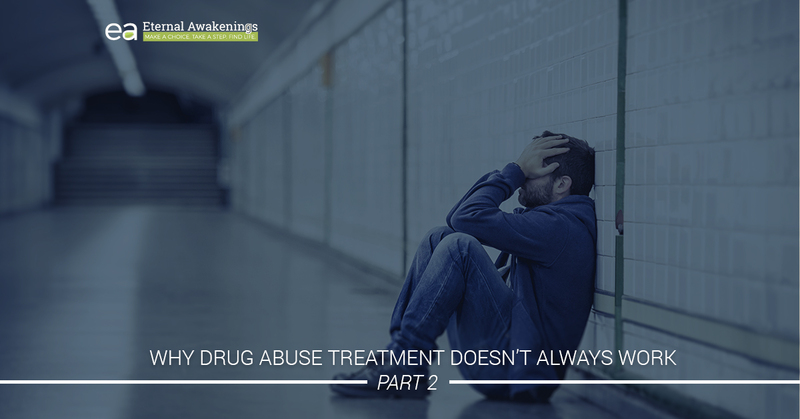 Unfortunately, many treatment programs end up falling into the trap of doing too much hand-holding and helicoptering, or worse, running the place like it’s a jail. Granted, every rehab program does need to have structures in place to enforce the rules and provide support. However, the initial period of hand-holding should gradually taper off and train you to be the independent person that you are. You’ll need to make the choice to stay sober independently once you leave the rehab center, and the program should be gearing you up to achieve that. There is a clearly laid out succession plan of how you’ll earn responsibility and earn privileges while you’re in treatment. The beginning of the program has more restrictions than the end of the program. The treatment program offers you ways to validate your capacity to make independent choices — before you exit the program. The staff understands what pressures you’ll be faced with when you go back home, and they implement training that will help you to be successful in facing those pressures. Eternal Awakenings is a program that is set up to take into account all the different factors that you’ll encounter once you leave the residential setting of our treatment. Ninety percent of our graduates remain drug and alcohol free two years later. You can be confident that when you enroll in rehab, you’ll receive training that builds you strong to make your own good choices without our help. This is a tough one, because it’s not that simple to sever long-standing relationships. However, if your friend group is using drugs or alcohol, it will only be a matter of time before you do, too. If there are people around you who are toxic or who are pulling you back to your addiction, it’s wise to create a little distance between yourself and them. Why is this important? While you’re in rehab, you’ll see a different, beautiful vision for yourself and your future. You’ll start to pursue that new vision. However, the wrong friends can cause you to lose sight of that vision. You forget. You unconsciously go back to the way you used to think. But down the road, you’ll wake up and remember. You’ll say to yourself, “I had this once! I knew it — I saw it — and I’ve forgotten.” The wrong friends are the ones who will let you forget. The right friends are the ones who will remind you of that beautiful vision and point you back to where you really want to be. Choose your friends carefully. You probably already know which ones will put you the most at risk of relapsing, but here are a few pointers. People who will keep you accountable. Create a strategy during treatment for how you will create some distance between yourself and the wrong people in a way that’s kind but also assertive. Also, think through a strategy for how you will pursue building strong relationships with the right people. Call our free helpline at 888-672-0298 to learn more about our program and find out if our Christian-based, residential rehab center would be right for you. We are located in a beautiful, historic mansion in Gonzales, TX, and we accept patients from all over the United States. Contact us today to get started with the enrollment process.